Additional Info: I am a French national. Having been a full-time tutor for 6 years now, I am very motivated, organised and very dedicated to helping students learn French. I have an English degree PTLLS (Preparing to Teach in The Lifelong Learning Sector), Level 4, Strode College, 2013. I have a degree in English and American Literatures ( DEUG) from the University of Brest in France, UBO. This included among other subjects translation from French into English and vice versa. I also studied English grammar, linguistics and phonetics. I have the level of License in the same subjects as above. My experience: I have been a full-time French tutor for more than 5 years now in Somerset. I have been helping adult students wanting to move to France, A level Students and AS students focusing on the curriculum with real help with Grammar, pronunciation, linguistics and also novels such as Mme Bovary. I also help GCSE students and adult beginner, intermediate as well as advanced students including conversational French. I have worked in America, Seattle, for The Alliance Française in addition to being a part-time private tutor. I also worked as a part-time private tutor while living in Wales (2004-2008). I enjoy helping people. I am patient and attentive. I am committed and truly want to help students. I use a clear, easy and efficient method to help students learn and speak French with confidence and be understood by others. I have been helping students study the novel Madame Bovary more in depth. This involves sessions where I prepare questions in French for my students. I expect the students to prepare answers in French. We discuss in French the style of the novelist, the main themes, the protagonists, the plot etc. I spent time carefully preparing sessions with the view of increasing the fluency of students. I focus on the pronunciation, grammar and spelling, syntax plus vocabulary. For this type of exercise, I always share with the students my own answers to the questions thus giving more chance for success. I sometimes tutor French students and help them improve their English (via skype). My focus here is more on the grammar and syntax. I do recommend that students really set aside time each week to study what we have done in the sessions to enable progress. I find that it is very beneficial to my tutees that I adopt a tailor-made approach to meet their own needs. As I am a French person I guide students with their pronunciation and can readily help them with expressions, make them aware of the standard of the language they want to use or already use and also avoid for them some pitfalls while abroad. I do find that it is important to listen to students so I can help them reach the goals they are aiming at. I truly enjoy seeing my students improve their confidence in spoken and written French. Pronunciation is very important to me as is giving tips for proper spoken French. This is very important from the start as it gives you more chance to be understood therefore making your experience in France or in a French speaking country a lot easier and nicer. I also show how to speak and write French by using short sentences as examples to improve the understanding of the language. William, Millfield school, Somerset, who took his French IGCSE: "Hi Annie, I would just like to thank you for helping me with my French as I felt much more confident before taking the exam and I hope that my result reflects all of the hard work. You have been so kind and patient with me and I wish you all the best in the future. "I would highly recommend Annie as a tutor to anyone learning French. She really knows her stuff – not just as a native French speaker but as a teacher who is tuned in to where a learner has problems and knowledge gaps. She is very helpful in supplying the information that you don’t get in the textbooks and in providing insights into both written and spoken French. 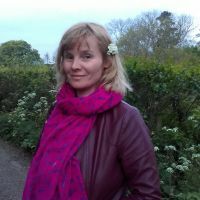 Add to that friendliness and a sense of humour and you have everything you could ask for in an expert language tutor." Kate from Blagdon in Somerset wrote in 2016: "Annie has a natural talent for teaching her native tongue. However, she backs this up with a useful knowledge of grammatical terms and rules, whilst also ensuring that the student is 'au fait' with colloquial French, both spoken and written. She has a knack of emphasizing the positive and endless patience when it comes to ensuring that the student has fully understood the point, as well as forgiving when s/he has (I have) forgotten it once again! Annie is both reasonable and flexible with a warm personality and a nice sense of humour. I have not a moment's hesitation in recommending that she become your French teacher if you are based in or near Glastonbury." I am very enthusiastic about literature. I was working as an actress and tourist guide at Glastonbury Abbey for five seasons ( 2009-2013) which gave me a lot of contact with groups of teenagers and adults of various nationalities. My role was to prepare and "perform"/present presentations in French and English. I have acquired a lot of experience with teenagers. I have an up-to-date CRB/ DBS certificate from 2017. Through my extensive experience with teenagers of various nationalities, I developed patience and tolerance. Every session is £20.00 per hour for beginner, intermediate, advanced students and £18.00 conversational sessions. This is for one adult student.